to every soul that looks up to him. all beings get up and set themselves up. without him, won’t the world be all gloom? lost in darkness and devoid of very life. days and nights, a result of his progress. as we would never know when to take rest. P.S : Thanks are due to Rupali who blogs at mazeepuran.wordpress.com for inspiring me to write this with her above clicked picture. I had questions that one had no clear answers to. caring only for more members getting added to them. to see them engrossed in petty chatter and rant? a snake meandered away, how close was I to death. was I pleased, to see a pool that appeared as feast? Why he cared for me, when God still eluded me? fail to appear, putting a halt to my journey? Son, why do you think, He evades you, a seeker? He keeps a roving eye upon you, all the time. a helping hand such as me, send to tend you. when you again strayed, his love persisted. and how glad would He be if you stuck with Him. 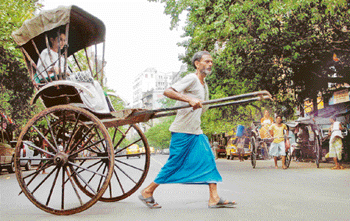 Harish had come to the city 3 decades ago and barring a small stint at a bakery in his early formative years, he became a rickshaw puller just like thousand others across the country. Over the years, as the country progressed, there came the cycle rickshaws followed by the auto rickshaws but like many others Harish would not move up the ladder and persisted with his manual one and never thought of changing cities and pitched his tent in Calcutta where he had arrived in the 70’s. Harish was in his late sixties and his daily schedule would be to have to his breakfast which consisted of rice gruel and a banana and then he would disappear into the big bustling city crowd and would be spotted at locations taking his passengers usually one or two with their luggage in tow. Passengers rarely remembered him, as for them, he was a means of cheap transport to be quickly forgotten as soon as they landed at their destinations. It always invoked the curiosity of people who have had the time to observe people like Harish to wonder about the source of energy to pull their passengers with just two hands to their destinations miles away on roads that sometimes sloped upwards and downwards. Harish due to some thought ingrained in his childhood had never visited a temple or never thought about the gods in them and always wondered whether people did get the benefit of visiting them. He must have carried hundreds nay a thousand in his umpteen trips up and down the city to holy shrines in the city. It was rather a coincidence, a strange one at that, having carted or ported so many devotees, he had never visited or entered a shrine so far, though he knew the gods and goddesses by their pictures that were splashed across by the religious minded across the city walls and in the outer precincts of the temples. Harish lived alone all these years except for this month when he got company. It was Nandhu, a boy of 8 years, whom he had rescued from the streets on a night trip. Nandhu seemed to be abandoned by his relations in the city or he appeared genuinely lost as he thought. By the look of the poor boy, he appeared to be from a very poor background and experience told Harish to keep him with him till he grew up in age to fend for himself. It was already 7 pm and since Nandhu was down with fever in the hut for the last two days, Harish had him at the back of his mind all day when he was scouting for work in the sun and rain who played their parts to perfection all through the day. Today was a bad day and he had made barely 60 rupees. Without at least 70, he could not take Nandhu to the doctor who lived near their shanty house for medicines. Moreover he had to get some food for dinner for both of them. He had been roaming through the city but somehow luck eluded him today. It only dawned upon him now that he had skipped his lunch like so many other days in the past. A light drizzle had started and Harish was hopeful that someone would hail him to escape it. As minutes ticked by, he knew he had to reach and get Nandhu to the doctor before 9 PM after which Sarmaji, the doctor would not see anybody. At his wits end, his legs impatient and his mind failing to control them, in despair he cried out to the Lord, whom he knew very feebly, for help and looked around desperately for that one passenger who could give him the last 30 rupees after which he could wind up work for the day. With his legs aching and stomach on a raging fire he wondered if he would ever reach home today. The small shops in the lane, where he and his cart were at standstill, were downing their shutters as the shop keepers too sensed that it was high time and with the rain not helping, they least expected any one to turn up at their shops. The sun having set an hour ago, it was quite dark except for the feeble street lights which were quite a distance apart. It was at this point of time, a couple emerged with some baggage and asked him if he could take them to the Ram Temple which was at a mile’s distance. The couple appeared young and dressed neatly in nice clothes, Harish wondered if he could reach them to their destination in time. Moreover the road to the temple was bad and had a slight slope and it would require all his strength to pull them across it. It was that moment of time the couple asked, as if in one voice, how much he would charge them. Harish was in two minds. He did not want to scare them away as he desperately needed the 25 or 30 as he had calculated earlier and asked them for 25, which was very fair considering the time and the weather. The couple hopped on to his carriage after a bit of bargaining and settling it at 20 rupees not withstanding Harish’s fervent pleas. After the price had been fixed it was left to Harish to show his experience to handle the cart and his passengers deftly as he pulled them slowly on to their destination. It took him a short and gasping run in the last 200 meters before he reached the temple just in time or so he thought. The couple got down and thanked him and he had to wait for the lady to count 20 coins and hand them to his outstretched hands. A lightening streak flashed, as she handed him the money, with the help of which he could see the charming couple’s faces. It seems they were newly married and had come to the temple as was the custom in those places on a Thursday. He saw them climbing up the stairs and entering the shrine. The despair call to the Lord an hour ago had worked and Harish wondered if it really was because of the Lord’s blessings, he had gained this last trip. Since it was so late and he having made his wages for subsistence for the day, he thought of entering the temple for the first time in his life. He had a lot of doubts as he climbed each step. What if the Pujari or the priest would shout at him for coming in such shabby and torn clothes? Nevertheless he walked on and entered the temple. There was no one in sight and having gained courage with each step, he walked on to explore the inner precincts of the shrine. He came to different places of worship allocated to each god or a goddess at various places inside the shrine. All this time, he was looking around with fear and awe, as with time, he still could not see anyone in the temple. Holding on to the coins, he at last reached the sanctum sanctorum where he saw the main deity and his consort and immediately recognized them by their robes and faces to his passengers who had graced his rickshaw, a few minutes ago.